1,590 pages | 20 B/W Illus. The notion of ‘human rights’ is perhaps the most weighty and widely recognized ethical category of our time, while environmental threats are among the greatest challenges currently facing civilization. It is unsurprising therefore that questions about and around the connection between human rights and the environment abound. Can harms inflicted by the activities of some humans on others through the medium of the natural environment amount to a violation of the latter’s rights? Do human beings have a right to an adequate environment? If so, is this ‘right’ already protected by existing, well-established rights—such as the right to life, or to health, for instance? Or do we need to recognize more specific environmental human rights? Anyway, is the language of human rights—and are the institutions that purport to guarantee them—ill-suited to the pursuit of environmental protection? If not, what can we learn from steps already taken in law and politics to link the aims of human rights and environmental protection? Interest in these and other questions has developed at a dizzying pace over the past two decades. Indeed, serious thinking about environmental rights is now a vibrant and dynamic area of study and research, and the sheer scale of the growth in its output makes this collection especially timely. Moreover, the highest quality work in the field has emanated from a wide range of different academic disciplines and perspectives, and has been published in a variety of largely specialist journals. Drawing on these and other sources, Tim Hayward has brought together in four volumes canonical and cutting-edge work to produce an indispensable one-stop ‘mini library’. 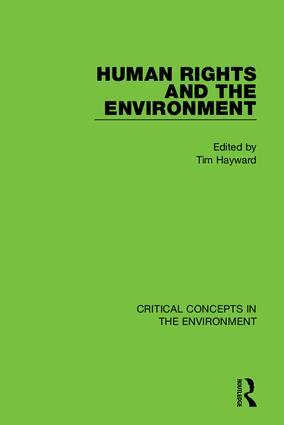 Human Rights and the Environment is fully indexed and includes a comprehensive and accessible introduction, newly written by the editor, which places the collected materials in their historical and intellectual context. It is an essential reference collection and is certain to be valued by scholars and students—as well as by serious policy-makers and practitioners—as a vital research and pedagogic resource. 1. Christopher D. Stone, ‘Should Trees Have Standing? Toward Legal Rights for Natural Objects’. Southern California Law Review, 45, 1972, 450-501. 2. Louis B. Sohn, ‘The Stockholm Declaration on the Human Environment’, The Harvard International Law Journal, 14. 1973, 423-515. 3. Joseph L. Sax, ‘The Search for Environmental Rights’, Journal of Land Use and Environmental Law, 6, 1990, pp.93-105. 4. Dinah Shelton, ‘Human Rights, Environmental Rights, and the Right to Environment’, Stanford Journal of International Law, 28, 1991, 103-138. 5. James W. Nickel, ‘The Human Right to a Safe Environment: Philosophical Perspectives on Its Scope and Justification’, Yale Journal of International Law, 18, 1993, 281-295. 6. Neil A.F. Popovic, Neil A.F. (1996a), ‘In Pursuit of Environmental Human Rights: commentary on the Draft Declaration of Principles on Human Rights and the Environment’, Columbia Human Rights Law Review, 27, 3, 1996, 487-603. 7. Tim Hayward, ‘Constitutional Environmental Rights: a Case for Political Analysis’, Political Studies, 48, 2000, 558–572. 8. Ernst Brandl and Hartwin Bungert, ‘Constitutional Entrenchment of Environmental Protection: a comparative analysis of experiences abroad’, The Harvard Environmental Law Review, 16, 1, 1992, 1-100. 9. Joshua J. Bruckerhoff, ‘Giving Nature Constitutional Protection: A Less Anthropocentric Interpretation of Environmental Rights’, Texas Law Review, 86, 2007, 615-646. 10. Jason Morgan-Foster, ‘Third Generation Rights: What Islamic Law Can Teach the International Human Rights Movement’, Yale Human Rights & Development Law Journal, 8, 2005, 67-116. 11. Alan Boyle, ‘Human Rights or Environmental Rights - A Reassessment’, Fordham Environmental Law Review, 18, 2006, 471-511. 12. Jonas Ebbesson, ‘Public Participation’, in D.Bodansky, J.Brunnée and Ellen Hey (eds), The Oxford Handbook of International Environmental Law (Oxford: Oxford University Press, 2012). 13. Kerri Woods, ‘What does the language of human rights bring to campaigns for environmental justice?’ Environmental Politics 15, 2006, 572–591. 14. Roda Mushkat, R., ‘Contextualizing Environmental Human Rights: A Relativist Perspective.’ Pace Environmental Law Review, 26, 2009, 119-177. 15. Ole W. Pedersen, ‘European Environmental Human Rights and Environmental Rights: A Long Time Coming’, The Georgetown International Environmental Law Review, 21, 2008, 73-111. 16. John H. Knox, ‘Linking Human Rights and Climate Change at the United Nations’, Harvard Environmental Law Review, 33, 2009, 477–498. 17. James R. May and Erin Daly, ‘Vindicating Fundamental Environmental Rights Worldwide’, Oregon Review of International Law, 11, 2009, 365–439. 18. Dinah Shelton, ‘Environmental Rights and Brazil’s Obligations in the Inter-American Human Rights System’, The George Washington International Law Review, 40, 2008, 733-777. 19. Carl Bruch, Wole Coker and Chris VanArsdale, Constitutional Environmental Law: Giving Force to Fundamental Principles in Africa, Washington DC: Environmental Law Institute, 2000, 70pp. 20. Richard Balme, ‘Mobilising for environmental justice in China’, Asia Pacific Journal of Public Administration, 36, 2014, 173–184. 21. Peter H. Gleick, ‘The human right to water’, Water Policy, 1, 1998, 487–503. 22. Deanna Kemp, Carol J. Bond, Daniel M. Franks, Claire Cote, ‘Mining, water and human rights: making the connection’, Journal of Cleaner Production, 18, 2010, 1553–1562. 23. Karen Bakker, K., 2007. The "Commons" Versus the "Commodity": Alter-globalization, Anti-privatization and the Human Right to Water in the Global South. Antipode 39, 2007, 430–455. 24. Dan Brockington, Jim Igoe, Kai Schmidt-Soltau, ‘Conservation, human rights, and poverty reduction’, Conservation Biology, 20, 2006, 250–252. 25. Annalisa Savaresi, ‘The Human Rights Dimension of REDD’, RECIEL 21, 2012, 102-113. 26. Richard Black, W.Neil Adger, Nigel W.Arnell, Stefan Dercon, Andrew Geddes, David S.G.Thomas ‘The effect of environmental change on human migration’, Global Environmental Change, 21, 2011, S3–S11. 27. Carol Farbotko, Heather Lazrus, ‘The first climate refugees? Contesting global narratives of climate change in Tuvalu’, Global Environmental Change, 22, 2012, 382–390. 28. Isabelle Anguelovski, Joan Martinez-Alier, ‘The "Environmentalism of the Poor" revisited: Territory and place in disconnected glocal struggles’, Ecological Economics, 102, 2014, 167–176. 29. Olivier De Schutter, ‘Large-scale land acquisitions and leases: A set of core principles and measures to address the human rights challenge’, Briefing Note, Geneva: UN Office of the High Commissioner for Human Rights, 11 June 2009, 1-15. 30. Edward H.Allison, Blake D.Ratner, Bjorn Asgard, Rolf Willmann, Robert Pomeroy, John Kurien, ‘Rights-based fisheries governance: from fishing rights to human rights’, Fish and Fisheries, 13, 2012, 14–29. 31. Alison Misselhorn, Pramod Aggarwal, Polly Ericksen, Peter Gregory, Leo Horn-Phathanothai, John Ingram, Keith Wiebe, ‘A vision for attaining food security’, Current Opinion in Environmental Sustainability, 4, 2012, 7–17. 32. Philip Cafaro, ‘Climate Ethics and Population Policy’, Wiley Interdisciplinary Reviews: Climate Change, 3, 2012, 45–61. 33. Stephen M.Gardiner, ‘Why geoengineering is not a "global public good", and why it is ethically misleading to frame it as one’, Climatic Change, 121, 2013, 513–525. 34. Jerry M.Spiegel and Annalee Yassi, ‘Lessons from the Margins of Globalization: Appreciating the Cuban Health Paradox’, Journal of Public Health Policy, 25, 2004, 85–110. 35. Jon Barnett and W. Neil Adger, ‘Climate change, human security and violent conflict’, Political Geography, 26, 2007, 639–655. 36. Chris Armstrong, ‘Against "permanent sovereignty" over natural resources’, Politics, Philosophy & Economics, 14, 2015, 129-151. 37. Julie Koppel Maldonado, Christine Shearer, Robin Bronen, Kristina Peterson, Heather Lazrus, ‘The impact of climate change on tribal communities in the US: displacement, relocation, and human rights’, in J.K. Maldonado, B.Colombi and R.Pandya (eds), Climate Change and Indigenous Peoples in the United States (Cham, Switzerland: Springer International Publishing, 2013), 93–106. 38. Avery Kolers, ‘Floating provisos and sinking islands’, Journal of Applied Philosophy, 29, 2012, 333–343. 39. Henry Shue, ‘Subsistence Emissions and Luxury Emissions’, Law Policy, 15, 1993, 39 – 59. 40. Tim Hayward, ‘Human Rights Versus Emissions Rights: Climate Justice and the Equitable Distribution of Ecological Space’, Ethics & International Affairs, 21, 2007, 431–450. 41. Simon Caney, ‘Justice and the distribution of greenhouse gas emissions’, Journal of Global Ethics, 5, 2009, 125–146. 42. Derek Bell, ‘Does anthropogenic climate change violate human rights?’ Critical Review of International Social and Political Philosophy, 14, 2011, 99–124. 44. Henry Shue, ‘Human rights, climate change, and the trillionth ton’, in D.G.Arnold (ed), The Ethics of Global Climate Change (Cambridge: Cambridge University Press, 2011), 292–314. 45. Stephen M.Gardiner, ‘Human rights in a hostile climate’, in C.Holer and D.Reidy (eds), Human Rights: The Hard Questions (Cambridge: Cambridge University Press, 2013), 211-230. 46. Lena Bendlin ‘Women’s human rights in a changing climate: highlighting the distributive effects of climate policies’, Cambridge Review of International Affairs, 27, 2014, 1–19. 47. Paul Baer, ‘The greenhouse development rights framework for global burden sharing: reflection on principles and prospects’, WIREs Climate Change 4, 2013, 61–71. 48. Edith Brown Weiss, ‘Our Rights and Obligations to Future Generations for the Environment’, The American Journal of International Law, 84, 1990, 198-207. 49. Richard P.Hiskes, ‘The Right To A Green Future: Human Rights, Environmentalism, And Intergenerational Justice’, Human Rights Quarterly, 27, 2005, 1346–1364. 50. Kristian Skagen Ekeli, ‘Green Constitutionalism: The Constitutional Protection of Future Generations’, Ratio Juris, 20, 2007, 378–401. 51. Simon Caney, ‘Human rights, climate change, and discounting’, Environmental Politics, 17, 2008, 536–555. 52. Alan Boyle, ‘Human Rights and the Environment: Where Next?’ European Journal of International Law, 23, 2012, 613–642. 53. Johan Brännmark, J., 2015. Future generations as rightholders’, Critical Review of International Social and Political Philosophy, published online, 2015, DOI: 10.1080/13698230.2014.966231, 1-19. Tim Hayward is Professor of Environmental Political Theory and Director of the Just World Institute at the University of Edinburgh.